The narrow-gauge West Clare Railway immortalised in song by the famous composer and engineer Percy French, operated services from this station from 1887 until 1961, terminating at Kilrush and Kilkee via Moyasta junction. 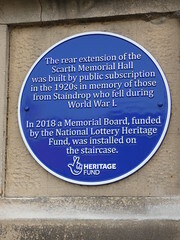 This plaque commemorates the line and all who served and used it. Erected in 2008 by the West Clare Railway (reconstituted) and Iarnrod Eireann to mark the restoration of part of the route at Moyasta, and original locomotive 5c "Slieve Callan"
Sir Edward Robert Peacock G.C.V.O. 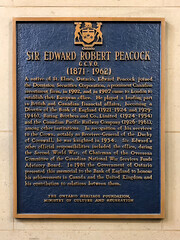 (1871-1962 A native of St. Elmo, Ontario, Edward Peacock joined the Dominion Securities Corporation, a prominent Canadian investment firm, in 1902, and in 1907 came to London to establish their European office. 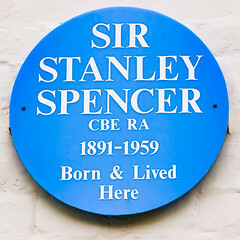 He played a leading part in British and Canadian financial affairs, becoming a Director of the Bank of England (1921-1924 and 1929-1946), Baring Borthers and Co., Limited (1924-1961), among other institutions. In recognition of his services to the Crown, notably as Receiver-General of the Duchy of Cornwall, he was knighted in 1934. Sir Edward's other official responsibilities included the office, during the Second World War, of Chairman of the Overseas Committee of the Canadian National War Services Funds Advisory Board. 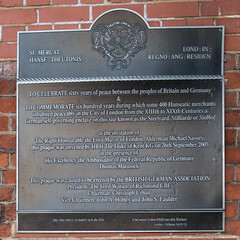 In 1981 the Government of Ontario presented this Memorial to the Bank of England to honour his achievements in Canada and the United Kingdom and his contribution to relations between them. Am 1. Juli 1890 wurde der "Verband der Fabrikarbeiter Deutschlands" als Gewerkschaft der ungelernten Arbeiter im Ballhof zu Hannover gegründet. In Nachfolge des am 2. Mai 1933 von den Nationalsozialisten zerschlagenen "Verbandes der Fabrikarbeiter Deutschlands" erfolgte am 17. Dezember 1946 in Hamburg-Harburg die Gründung der Industriegewerkschaft Chemie-Papier-Keramik. Der Sitz dieser Gewerkschaft ist seit 1890 Hannover. 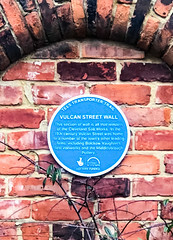 101 Farm Lane This site was first developed in the 1890s as a horse bus company depot. It was then used by various motor bus companies and by the British Motor Cab Co., who probably built the double-arched entrance around 1910. Sir Malcolm Campbell, holder of land and water speed records, operated an aircraft engineering firm from here in the 1920s. William Court stands on the site of the former head office of the Shepherd Building Group from 1927-1995. 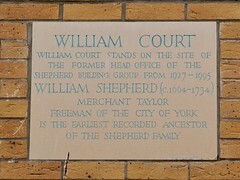 William Shepherd (c. 1664-1734) Merchant Taylor Freeman of the City of York is the earliest recorded ancestor of the Shepherd family. Formerly Charlotte Baptist Chapel 1818 - 2016. Relocated to 58 Shandwick Place. Pikeing Well. Several wells existed along this stretch of the river. In 1740 New Walk was extended from Blue Bridge past Pikeing Well. 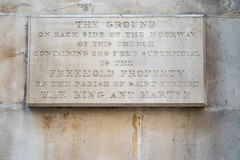 In 1749 the corporation of York agreed to “contract with proper workmen for the making of a hansom fountain at Pikeing Well”. A well house was built in 1752 to the designs of John Carr who later become Yorkshire most notable Georgian Architect. 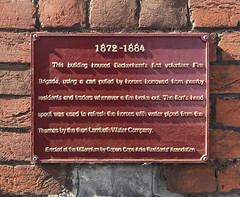 In 1858 a re-building of this well house by Thomas Pickersgill the City Surveyor. 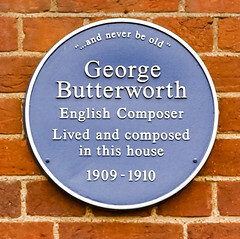 The structure is now listed grade II*. Water from the well was thought to have medicinal qualities, particularly in the treatment of sore eyes. 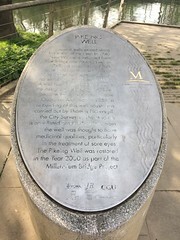 The Pikeing Well was restored in the year 2000 as part of the Millennium Bridge Project. 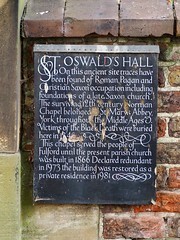 St. Oswald’s Hall. On this ancient sites traces have been found of Roman, Pagan and Christian Saxon occupation including foundations of a late, Saxon church. The surviving 12th century Norman Chapel belonged to St. Mary’s Abbey, York throughout the Middle Ages. Victims of the Black Death were buried here in 1349. This chapel served the people of Fulford until the present parish church was built in 1866. Declared redundant in 1973 the building was restored as a private residence in 1981.